Okay, the first thing I thought of was the Pixar Short video of "The Birds" --- too funny. About a dozen more little ones, one big goofy one and you'd be all set! This is completely unrelated to today's picture, which is very cool, but you were the first person I thought of so I'm sharing! On Big Brother last night (yes I'm a pathetic reality tv show addict, you may make fun of me) the houseguests got a sheep! It wasn't nearly as cute as any of yours, but it was a sheep and that of course made me think of you and Cary and the rest of your flock. Me too!! 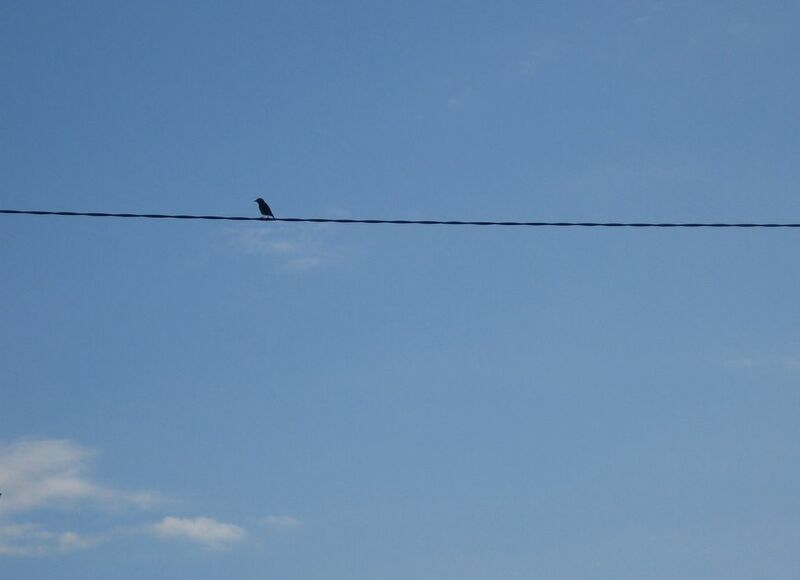 Thought of bird on a wire that is!! Wonder what sort of bird it was, looks like a crow to me! 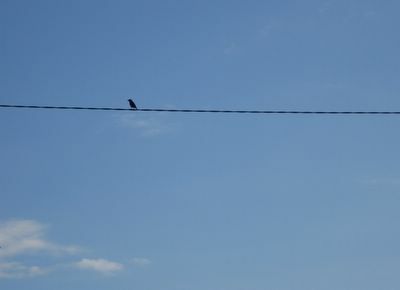 Enjoy those solitary birds in the country. Here in the burbs, they are all crowded together on the wires and make so much noise that it could not resemble beauty in any form. Of course, the birds are those very loud gackels. I do have Skye Bird-dee who is a "lone" birdie here in the house. She took off in flight yesterday and now that I think about it, I could have had a similar photo with a very petite bright blue bird, all by her lonesome self on a window sill. LOL! I hope that you got rain last night. We were teased, but it totally bypassed us --- again. We are so desperate for rain! Great shot Farmgirl... I guess that's the early bird who got the worm! !